This past week CVS had a pretty sweet deal on all Physicians Formula, so I took this opportunity to buy a back-up of my favorite neutral eyeshadow palette (which I have hit major pan on!). Which made me realize that this was a perfect time to review this palette, since now I had a brand new one in the box! So, let’s dive right in. If you’ve never tried this palette out before, you’re really missing out! I purchased the product below with my personal funds. ~ Safe for sensitive eyes and contact lens wearers. The first thing that grabbed my attention about this palette was the fact that all the shades were matte and varying shades of brown/taupe. 🙂 (You know this girl — all about them mattes!) I hadn’t really heard much about this palette, so wasn’t sure how the pigmentation or lasting power would be. There are three different quads in this collection, and I picked up the one called ‘Canyon Classics‘. The packaging is really cute, compact, and easy to take on the go. There’s also a little double-sided doe-foot applicator inside, though I never used it and eventually lost it along the way. This compact palette quickly soared from an uncertain purchase to my all-time favorite eye palette to use. The colors are beautiful and suit my skintone perfectly when I want a more neutral eyelook for the day. Not that it’s sheer or doesn’t show up — if I want, I can get a beautiful smokey eye with this palette! The shadows blend out beautifully and I find it really easy to build up the intensity of the color, depending on if I’m doing a day or night look. I know that two of the shadows look very similar, but they’re actually not. One works beautifully all over the lid and the other I blend into my crease as my contrast. They both work together perfectly. There are SO many things I absolutely LOVE about this palette. It’s pigmented. All the colors are matte. It blends like a dream. You can easily take a look from day to night. It’s travel-friendly. When it comes to thinking of dislikes for this palette…I have a very hard time with that. One thing that I do notice is that if I’m doing a more intense eyelook and want to darken the outer V, I have to finish by using a different black (from my LORAC Pro to Go Palette) to intensify the color. The darkest shade in this palette is more of a smokey black or gray then a true, pigmented black. I personally don’t have a problem reaching for another color when I need black. And for an every day look, the darkest color in this palette will suite me perfectly to darken my outer V.
I’m pretty sure you can tell by this time (and because I said it’s my all-time favorite palette, obviously…), but I absolutely love the Matte Collection’s Quad Eyeshadows! If I’m ever doing my makeup and don’t know what eyeshadows to use, I instantly grab this one and know that I will love the end results. As you can tell from the picture of my current palette, I’ve hit major pan on all of the shadows. That right there should tell you something — while I wear eyeshadow on a daily basis, I’ve never hit pan on any of my other shadows. This palette is definitely one that you need to have in your makeup collection. It’s so dependable! And if you’re wanting to get your first neutral eyeshadow palette, this is a $7 well spent. It will last you for a while and has the essential neutrals to give you a beautiful eye look every time. Question for My Readers: What is your go-to palette for a neutral eyeshadow look? 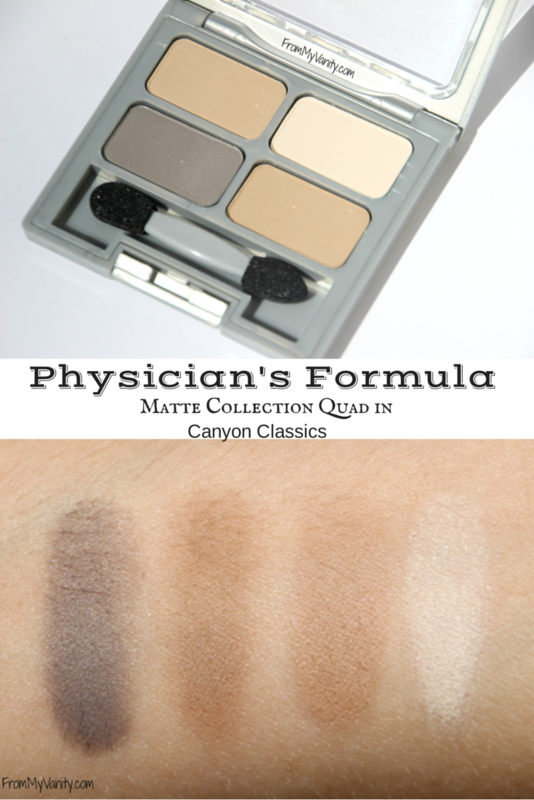 Have you ever tried this palette from Physicians Formula? Thank you so much for sharing this! As a person with sensitive and dry eyes, I cannot wait to try their products. I'll have to let you know how it goes. 🙂 Thanks for sharing. I have been using the eyeliner+serum and one of the eyeliner shimmer strips trio and a mascara and I love them. They work well, I don't have too much trouble taking them off, and they don't typically bother my eyes. The eyeliner and mascara doesn't give me any trouble. The shimmer strips do dry my eyes out some, but only after a long time and it's not bad at all, especially compared to other brands. Thank you so much for sharing about this about this brand. It's been super beneficial for me. One thing I might recommend — do you use a eyeshadow primer or, like, a Maybelline Color Tattoo under your shadows? Sometimes you can find one that will give you some moisture and not dry your eyes out so much. Just an idea. 🙂 Thanks for your comment love, girl!